← PDVSA ships fuel to Syrian regime: Chavez risks sanctions? 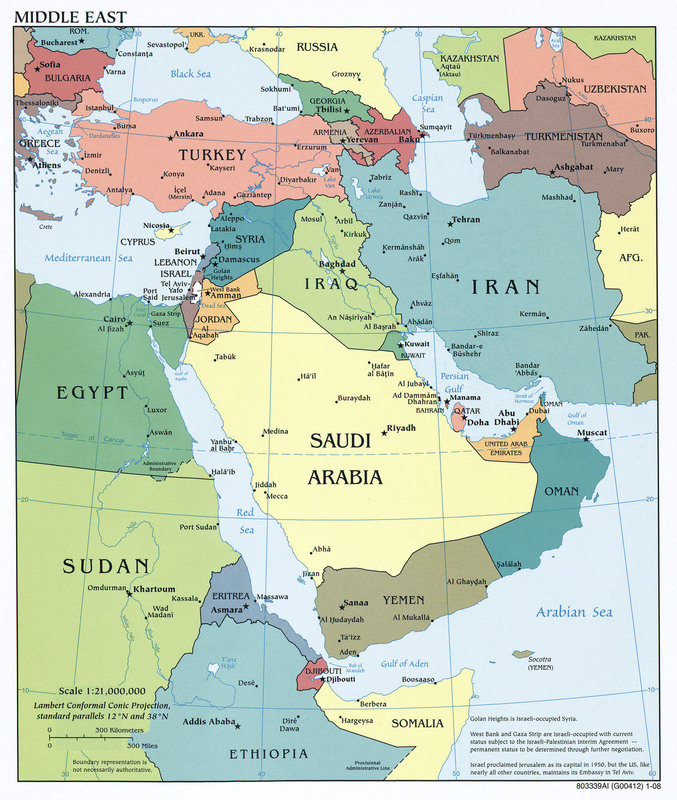 and there are certainly major geopolitical issues in OPEC‘s Mideast and North African (MENA) member states–which is what this post is about. It is certain that the Iran confrontation will only intensify as the mid-summer sanctions deadline approaches. By July, Washington and the EU hope to significantly curtail Iran’s ability to export oil. In this situation, it is perhaps surprising that prices have not gone higher. The cushion of spare supply is thin. Oil stocks in rich countries are at a five-year low. The extent of OPEC’s spare capacity is uncertain. 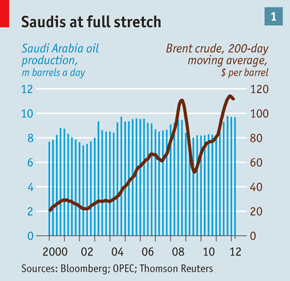 Saudi Arabia is pumping some 10m b/d, a near-record high (see chart 1). And there is the threat of far bigger supply disruptions if Iran were ever to carry out its threat to close the Strait of Hormuz, …. Even a temporary closure would imply a disruption to dwarf any previous oil shock. As for Riyadh, their recent activity demonstrates that they are not about to allow the new Iran-sanctions regime to fail due to any oil shock or faltering domestic support by U.S. or European publics upset about high gasoline prices–not if they can help it. And, so they are pumping all they can pump. If this were the 1980’s or 1990’s, the effect would have been much more profound. There were periods back then when the Saudi’s had 40% spare capacity available to dump on the market as the world’s oil-price “swing state.” But, alas, today the Saudi spare capacity fraction is lower, and their share of global production is also lower. So, we shall see. Consider that, after Saudi Arabia, Iran is OPEC’s second largest exporter (though Iraq is pushing to challenge Iran-see Reuters here ). As the Administration has asserted from the beginning, they intend to shut down Iranian exports “carefully”–carefully enough not to cause any spikes in oil prices, especially considering the fragility of the economic recovery. This is, of course, not an easy task–and the Iranians are naturally disinclined to help with the process. It matters little if the Iranians could actually shut down the Straights of Hormuz for very long, just threatening to do so has had a major impact. I wrote at length in two earlier posts [here and here] about China’s angst at these sanctions, about its wanting to be taken care of if they have to stop buying Iranian oil. And the Saudi’s are indeed working with D.C. to take care of China and other major importers of Iranian crude, so as to get them on board. In fact, this has gone so well that President Obama publicly thanked Beijing for supporting the sanctions. In Kuwait last week, Ali Naimi, Saudi oil minister, said the kingdom remained “poised to make good any shortfalls – perceived or real – in crude oil supply”. The promise to offset “perceived” shortages goes beyond previous statements by Saudi officials pledging only to make up for actual disruptions in the market. Let’s step back and be clear about what is going on here: It seems to me that the Saudis’ methodically executed oil-sector moves in recent weeks are aimed at assisting the Obama Administration and Brussels to bring “devastating sanctions” upon Iran. This all shows that the now-six-decades-old “special relationship,” begun by FDR and King Saud, is still alive and well. Whatever the implications for today’s Arab democracy movements, it is the Iran confrontation–and Saudi cooperation–that are presently front and center on Washington and Brussels’ agenda. Riyadh may or may not like to see President Obama reelected in the coming elections, but they certainly want the Administration to not lose public support for Iran sanctions because of high domestic oil prices. Can Negotiations Prevent a Conflict? One final point: Any geostrategic project that has gotten to the degree as has the present confrontation with Iran, does not simply fizzle away. The Obama administration has already expended the majority of its diplomatic capital on this issue for three-plus years; it has come to affect energy relations with China, Europe, India, and Japan; it is risking the security of the global oil market and, with it, the struggling economic recoveries in the U.S. and Europe. Indeed, any such project historically by a Great Power has not generally fizzled away. It is difficult to imagine how a major turning point will not be reached sooner or later, probably in some months, in this confrontation with Iran. Simply put, too much has been invested and too much is being risked to imagine the superpower now reversing course, unless another major international security crisis (or political-economic crisis) diverts its attention and resources. If there is to be a negotiated settlement of this crisis, we will have to see evidence of significant movement soon–which does not preclude a simultaneous intensification of the confrontation. To this end, it is necessary to imagine what a mutually acceptable accord might look like, including how it would be mutually verified. Is there any such possible negotiated solution? And, one wonders how the Saudis and Israeli’s would react if Washington and Tehran reached a “grand bargain” of some type. If one cannot even imagine the elements of such an accord, and, from what I can tell, very few can, then the implications are very serious indeed. This entry was posted in China, Economic Crisis, Euroepen Union, international relations, Iran nuclear, Iran sanctions, OPEC, Persian Gulf, Resource conflicts, Sanctions, The USA, U.S. oil, Uncategorized and tagged China, Iran, Middle East, Obama, OPEC, Saudi, Saudi Arabia, United States. Bookmark the permalink.